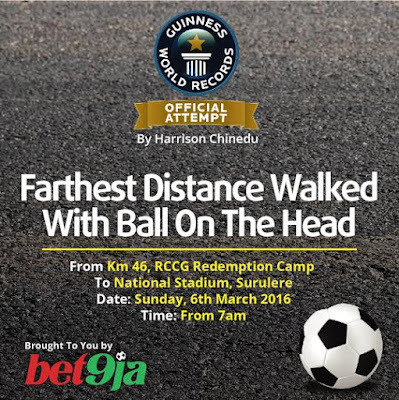 Nigerian Chinedu Harrison has broken and set a Guinness Book of Record for the Farthest distance walked with ball on the head. Chinedu began his journey yesterday Sunday 06 March at 7am from Kilometre 46 at the RCCG Redemption Camp and broke the record by not allowing the ball to touch the ground before reaching the National Stadium in Surulere. The history-making event which was flagged off by representative of Minister of Youth and Sports, Demola Ali, after the ball and his head was inspected by President of Nigeria Referees Association, Tade Azeez assisted by former FIFA-badged referee and senior lecturer at the National Institute for Sports, Dr. Alex Mana, and ex- Olympian, Henry Amike, saw him trek from the Redeemed Camp to the National Stadium, Surulere, Lagos. At the National Stadium, he trekked round the main bowl eleven times to break the record before trekking further eleven times to set a new record. Chinedu told National Mirror that he was happy to put Nigeria in the World Records, even as he ascribed his feat to hard work and dedication. The athlete, who expressed appreciation to the Rafiu Oladipo Sports Foundation which organised the event, for believing in his abilities, stated that his greatest challenge during the event was when he nearly had a muscle strain at Berger Bus Stop.